The fancy little devil himself. Trader Joe’s Truffle Mousse Pate is without a doubt the fanciest thing I’ve bought from a grocery store. Fancier than the Dukkah, fancier than the organic stone-ground Mexican chocolate, fancier than a lot of things . What is a pate? What is a truffle mousse? How do you render truffles into a mousse? Why is the pate vacuum packed in a tiny, plastic tray? What is the meaning of the weird, centimeter of gelatin coating the bottom of the pate? Look, I won’t try and delude you here – I’m a johnny-lunch pail sort of gourmand, a brutally unrefined taster of interesting nibbles and such. I, and I’m really emptying out my soul here, have never had pate before. I don’t really have a really solid grasp of the pate world. I couldn’t tell you what marks a good pate form a bad pate, or alert you if you were about to bite into a pate smeared brioche that had gone south a week ago. If you had seen me at the Trader Joe’s you would have seen a curious, rotund man quizzically turning over a block of pate in front of his eyes, clearly befuddled. This is all beyond my ken – so this is your chance to bail out now if you fancy yourself something of a pate snob. What you are about to read are the unvarnished musings of a pate initiate. Okay, first question – let’s see if we can figure this out. What the hell are the truffle, the mousse, the brandy aspic and the pate all doing to each other in this thing? Let’s start with what I know. Pate is any chilled, meat paste – most famously encountered in the form of foie gras – a pate made of goose livers. Trader Joe’s isn’t delivering on goose liver, but decided to keep it in the avian organ family and is giving us chicken liver instead. When you’re selling a ground organ paste, and trying to market it to humans instead of cats, you need to do two things – give it a fancy foreign name (check), and ensure you’re doing something suitably cruel to justify the cost. Goose liver pate has come under heavy fire in the last few years, in California particularly, due to the rather inhuman method of it’s creation. Namely, a goose is locked in a box and force fed until it’s liver swells to triple the normal size, at which point it is butchered and the liver cut out. Trader Joe’s seems to be rather deliberately side-stepping the issue by sourcing their livers from chickens instead of geese – though you’ve got to imagine that TJ’s is only fooling themselves at this point. If you’re going to be outraged about the geese, you’re going to be outraged about the chickens. Continuing the foie gras similarities is the addition of truffle mousse. Truffles are, of course, famous for being really expensive mushrooms that pigs hunt. Truffle mousse is most commonly made when truffles are whipped up with foie gras, though in this case it is our chicken liver pate they are mixed with. Presumably this is to make the pate very tasty. Unfortunately, the flavors of the mushroom and truffle mousse, being folded into the chicken liver pate, is beyond my proletarian tongue’s ability to tease out. The final noteworthy addition is the brandy aspic, which takes the form of a thick level of gelatin that’s congealed along the bottom of the pate. Why stick a layer of brandy-infused meat jelly on the bottom of a truffle mousse pate? Well, primarily because it’s traditional to include some sort of refined alcohol (aspic or otherwise) with pate, and having tried it I can only imagine that it’s there to offset the otherwise overpoweringly intense flavor of the pate itself. By itself, this aspic jelly doesn’t taste like much – whatever bite the brandy had has been much muted by it’s inclusion in a meat jelly – so it gives your tongue a cool respite from the heavy liver and truffle flavor. The pate itself tastes musky, very musky, and thick with very savory, complex meaty flavors. It is not overly salty, or any other taste –but rather overwhelms you with it’s heavy, liver taste. Pate is, as we discussed, basically just liver – and if you’ve ever had ground liver in any of its forms you simply have to amplify that taste in your head several times and you’ve got an approximate sense of what to expect. 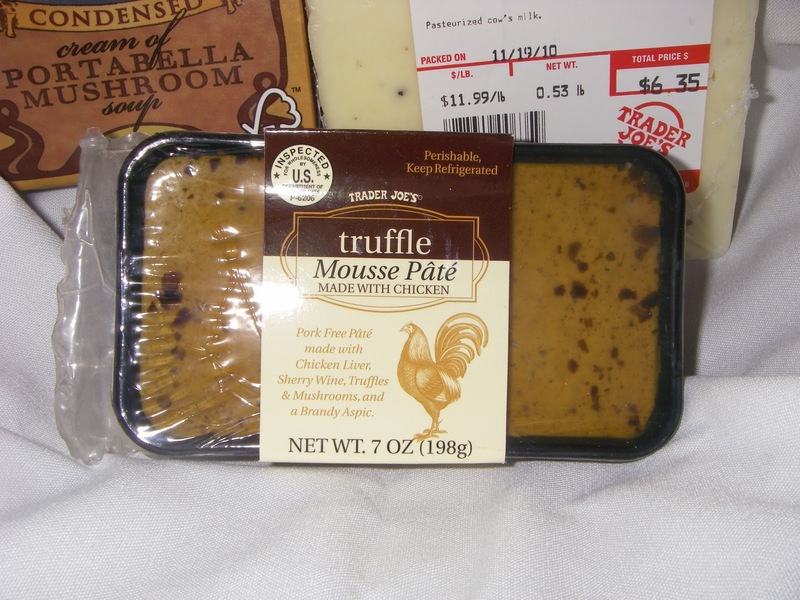 Most shocking is that Trader Joe’s Truffle Mousse Pate – for all the truffles and pate and brandy aspic, is reasonably priced at $6.00 / 8 oz. A little pate goes a long way, so this little brick should be enough to please the whole party. That is, if your party is the type where people are going to be pleased by cheap pate. God knows I love Trader Joe’s for their true dedication to affordable prices, but in this case I believe it’s actually the final mark against them. Pate, after all, is like caviar in that it is appreciated more for its elegance than its taste. There is a food to compliment every hue of the human spectrum, and pate just happens to fill the niche of hoighty-toity cuisine. A budget priced pate undercuts it’s reason for existence. Caviar and truffles and pate are good and all – but there’s a reason they aren’t potato chip flavors. People aren’t flocking to truffles and pate because it’s the absolute taste sensation, it’s value lays in the price at the cash register. Offer an expensive pate and you’re a classy host, a cheap pate and you’re a cheap host – taste has always been secondary. That said, let us never underestimate the trumpeting blast of democratization. If you, like myself, have never had a pate, let alone a pate infused with black truffles, then why not pick up some crackers and give it a whirl. Surely, there has never been a more opportune time then now. Would I Recommend It: Only to the very curious. Would I Buy It Again: I don’t host those kinds of parties. Final Synopsis: A cheap version of a very upscale snack. I also think this is a great product. The texture is amazing and the it tastes delicious! Yum! This review is from a very narrow minded individual. In Europe, where I grew up, pate is a common appetizer served as an appetizer at many parties and dinner parties. It’s served and eaten like cheese – pig’s, lamb’s and chicken liver pates are common in supermarkets and not expensive. In the US, there’s some kind of snobbery associated with a very healthful food – mostly from ignorance. Thank you Trader Joe’s for stepping out and giving us your reasonably priced equivalent! I agree with the other comments. I love this product and my French husband says it tastes like the pate his mother made. To think pate needs to be expensive in order to be good is the worst kind of snobbery. I, also, find the flavour of the liver to be very delicate. Ouch, consider myself schooled. I still stand by my comments (as a regular sort of Joe) – I guess I just don’t get liver pate. There is nothin’ to it. You’d mix up your fatty liver, pack it in a study piece of crockery and seal it with grease or wax so it would keep longer. This was country cookin’, very much like my native headcheese, which also ground meat in gelatin. How these farmyard redneck dishes got to be snobby is beyond me. Liver mush, pate, they all go good on biscuits! When discussing the sale of organ meats in American, unfortunately the author of this article is again very late 20th Century in his thinking. Our American ancestors “ate everything but the oink” until as a nation we were rich enough to decided that we would only eat muscle meat from certain animals. Organ means are now wasted in American due to our total monochromatic range of culinary food tastes. Look at the American menu. It is trite and almost the same in every restaurant regardless of the type. American cookbooks from the 1940’s and 50’s list directions as to how organ meats should be cooked in the balanced diet. Today our cookbooks only cover what the spoiled middle class will eat – namely beef, pork and chicken muscle tissue. McDonald’s Anybody?!?! The accusation of using a fancy foreign name to describe pate is childish. I don’t know a single French speaking person who thinks the word is fancy – or their language for that matter. Besides, you can’t call pate “ground liver” as it is not always ground and it is carefully seasoned and cooked in a prescribed manner. Chopped liver is closer, but then it sounds like a dish served at the local kosher deli. Pate has a specific process to cook/make and present which in English we don’t have a translation. Fault our language for not enough words if you really want to place blame. If the author is monolingual is not the reader’s fault. As for truffles. Pigs being allowed to hunt for truffles was outlawed over 100 years ago. Truffles are rare mushrooms – nothing more. Can you really WHIP a mushroom into a mouse form? Not really. Truffle is not a adjective and is not listed on the same line as the word “mousse” on the Trader Joe (TJ) label for a reason. It is an advertising stunt just like “New and Improved” or “With just a hint of….” It is intended for lunch box people who want to put on airs and don’t know any better. Did you read the ingredients? Ingredients are listed in the order of volume in the product. Truffles are number 11 out of 15. ANYTHING in the USA that says it has Truffles and does not reflect the cost, you can bet will be nothing more than a joke. Note that the products that list truffles never say HOW MUCH truffle is included. Since truffles cost over $330/pound how much do you really think is going to be in your little seven ounce package of chicken liver goo being pawned off by TJ that cost less than $6.00? 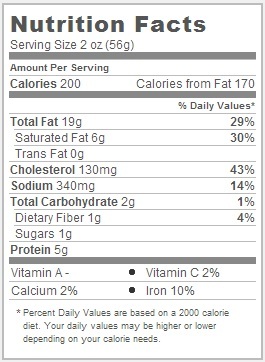 Mushrooms (that means the cheapest available) were listed as seven out of 15 ingredients. How can you tease out at taste of a truffle if you load the product with cheap button (?) mushrooms? Has the author ever tasted a truffle alone or with his “proletarian tongue” has he ever been willing to pay for enough to be noticeable in a dish he as eaten? As for Aspic. If the author thinks that Jello is aspic, why bother continuing this discussion. Good brandy suspended in a true aspic is not only light and refreshing, but offers a contrast of texture along with a dash as sparkle as one would add a pinch of salt or dash of pepper sauce. Regarding the author’s comment that an aspic is solely to covers the “heavy” taste of truffle, I can only laugh. Truffle when used correctly is never “heavy.” Aspic is far too delicate when made from scratch. In review of your article, I can without reservation call the author a “Counter-snob.” The author doesn’t have the desire or wallet to find out why the real deal is appreciated. Undoubtedly in many fields. Instead he makes sweeping statements about a sad copy of the real McCoy and then makes sweeping generalization to support his lack of exposure or knowledge thereof. In race car driving it, would be the same if one went watch a bunch of South American teens race their jalopies around a dirt track in the countryside and pronounce with great authority that the Indy 500 is nothing more than a dirt race for the rich. Another good comparison would be for a native of India to taste a vegetarian hot dog and condemn the real thing as being a bourgeois American staple for people with no taste but only who eat it out of tradition. There is nothing wrong with being uneducated. Opportunity and experience can fix that. Taking pride in Ignorance and self importance is a true travesty. P.S. There is nothing wrong with Chicken liver pate – all you need is a little knowledge, a good recipe and very little money. I’m glad you like my blog! If you enjoyed this post, you should definitely consider checking out my review of dolmas and truffle salt. I love this guy. Not just a tool, but the full blown toolbox and doesn’t even care. Do an article next about how cow tongue should be a perfectly acceptable cut of meat to make beef Wellington out of in place of the over hyped tenderloin roast. I appreciate you so much for your reply to this fella! Loved your comments, stumbled on them since I was looking for pate for my Beef Wellington while in Tampa, but the part of South American kids racing jalopies around the race track is a bit far fetched since you are forgetting the great Sena and Fitipaldi among others! Anyway any advice on a pate readily available in Tampa groceries? I just got some Truffle mousse pate at Whole Foods in Tampa. LOVE LOVE LOVE this stuff!!! I can only get it every once in a while since I eat too much in one sitting, but this stuff is delicious. I don’t eat the jelly top, only the smooth pate under it, but everyone has their own tastes, so to each their own. Reminds me of when I use to eat liver and pate with my mom as a kid long ago. Love it! I don’t host those kind of parties either- whatever they are- but I still serve this! Love it on Trader Joes brioche toast (crackers). Always a hit with the guests. Don’t stick your nose where it doesn’t belong. In this case, don’t review a product when you have no basis of comparison in any shape or form. You could have at least respected your readers enought to take the time to do even rudimentary research. I love this product. It tastes great and we have it as a staple in my refrigerator. It’s also a terrific value. Way to go T. Joe! Just read this and was going to comment but looks like everything I wanted to say has been said. THANK YOU! I’m glad some people like this pate, but it was way too gamey and “cat foodie” for me. I guess I like a more subtle and mild chicken liver pate.